The following image was scanned from Father Georges Desjardins, s.g. Antoine Roy dit Desjardins (1635-1684) and His Descendants. The American Colonies had launched the Revolution or their War for Independence from Great Britain. Their troops invaded Canada. This invasion was called the Bostonian's War (1775-1776). As Captain of the Militia for the St Lawrence coast, Augustin organized the resistance of the militia for all of Kamouraska against the invaders, occupying himself to recruit and group them. The British Flag, sign of the rallying point, was flying in front of Augustin's house. 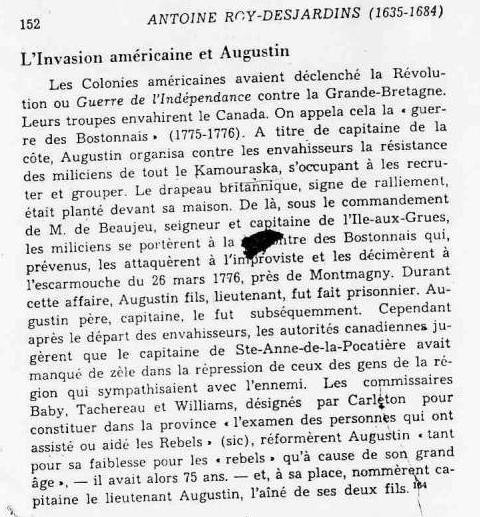 From there under the command of Monsieur de Beaujeu, seigneur and Captain of l'Ile-aux-Grues, the militia left to encounter the Bostonians, who had been forewarned attacked them at will and decimated them in the skirmish of 26 March 1776, near Montmagny. During this attack, Augustin, son and Lieutenant became a prisoner. Augustin, father and Captain, likewise was captured later. After the invaders had left, the Canadian authorities judged that the Captain of Ste Anne de la Pocatiere lacked zeal in repressing those citizens in the region who sympathized with the enemy. The Commissioners Baby, Tachereau, and Williams, designated by Carleton to conduct an inquiry into those persons in the province who had helped or assisted the Rebels, removed Augustin as much for his weakness for the rebels as for his advanced age (he was 75 at the time) and named as Captain, Augustin, the oldest of his two sons.